The aircraft project was named the 2014 winner of the Collier Trophy, for having "strengthened business aviation through significant technological advancements in aircraft performance, cabin comfort, and safety." The G650ER is an extended-range version of the G650. The 300th was delivered in April 2018, just over five years since introduction in December 2012. The wing design was completed in 2006. A total of 1,400 hours of wind tunnel testing was completed by 2008. A pressure-test fuselage was built and tested, including an ultimate-pressure test of 18.37 psi (1,267 hPa). The G650 taxied under its own power for the first time on September 26, 2009. A public rollout ceremony was later held on September 29, 2009. The G650 had its maiden flight on November 25, 2009. Flight testing for the maximum operating speed of Mach 0.925 was announced as completed on May 4, 2010. Gulfstream reported on August 26, 2010 that the G650 hit a maximum speed of Mach 0.995 during a dive as part of its 1,800-hour flight test program. In April 2011, a G650 crashed shortly after lift off. The cause was determined to be related to the speeds carried out for the single engine take off run. The G650 test aircraft were grounded until May 28, 2011, when the remaining test aircraft were allowed to return to flight testing. On September 7, 2012, the G650 received its type certificate from the US Federal Aviation Administration (FAA). Its first delivery was to an American customer named Preston Henn on December 27, 2012. The G650 had a nominal list price of $64.5 million in 2013, but there was a three-year waiting list. Some aircraft produced for delivery in 2013 sold for more than $70 million to buyers that wanted to take immediate delivery. After rising to $71-73 million in 2014, initial enthusiasm dissipated and the value of pre-owned G650s stabilized at $50 million after the competing Bombardier Global 7500 was certified in 2018. On May 18, 2014, Gulfstream announced at the annual European Business Aviation Association exhibition, that it had developed an extended range version called the G650ER. The G650ER is capable of flying 7,500 nautical miles (13,900 km; 8,600 mi) at Mach 0.85, due to its 4,000 pounds (1,814 kg) increase in fuel capacity. Gulfstream stated that in March a G650ER development aircraft had flown non-stop from Hong Kong to Teterboro, New Jersey in the United States, a distance of 7,494 nautical miles (13,879 km; 8,624 mi); it had also flown non-stop from Los Angeles to Melbourne in Australia. The extra fuel is housed in existing space inside the G650's wings and aircraft already built may be quickly upgraded to the ER version. The G650ER received its certification in October 2014 and began deliveries in late 2014 ahead of its 2015 target. The G650ER attempted two world records from New York to Beijing to Savannah in February 2015. The same year, a G650ER set a new record for the longest non-stop flight by a purpose-built business jet, flying 8,010 nautical miles (14,835 km; 9,218 mi) from Singapore to Las Vegas with four passengers and crew. The record was surpassed by a Bombardier Global 7500 in March 2019, before the G650ER retook the record in April 2019 by flying 8,379 nmi (15,518 km) from Singapore to Tucson. Also in May 2014, Gulfstream confirmed that the G650 would be offered to the United States Air Force for its program to replace the E-8C JSTARS air-to-ground surveillance and targeting aircraft. The still emerging requirements call for an aircraft with a 10-13 man crew and a belly-mounted radar 3.9–6 m (13–20 ft) long. However, during the fiscal 2019 budget rollout briefing it was announced that the Air Force will not move forward with an E-8C replacement aircraft. Funding for the JSTARS recapitalization program will instead be diverted to pay for development of an advanced battle management system. In September 2018, Gulfstream was conducting testing at London City Airport to certify the aircraft to perform steep approaches. The G650 has a cruise speed of Mach 0.85 to 0.90, with maximum speed of Mach 0.925 and a range of up to 7,000 nmi (13,000 km). It can be equipped with a full kitchen and bar and may be equipped with a variety of entertainment features including satellite telephones and wireless Internet. The jet uses two Rolls-Royce BR725 engines, each producing a maximum thrust of 17,000 pounds-force (75.6 kN). Gulfstream states that with a weight of less than 100,000 pounds (45,400 kg), it is able to land at small airports avoiding the busy airports around the world. To provide better usage of the internal volume, Gulfstream designers rejected the usual circular fuselage cross-section in favor of an oval which uses a flatter lower portion. The cabin is 8 feet 6 inches (2.59 m) wide and 6 feet 5 inches (1.96 m) high, allowing the craft to be configured to carry between 11 and 18 passengers. The fuselage is of metal construction; composite materials are used for empennage, winglets, rear pressure bulkhead, engine cowlings, cabin floor structure and many fairings. The elliptical cabin windows, eight on each side of the fuselage, are 28 inches (71 cm) wide. Panels are bonded rather than riveted, reducing parts count compared to the G550. The wing uses greater sweep (36 degrees) than previous Gulfstream aircraft (for example, the G550 wing has 27 degrees of sweep). It does not use leading-edge high-lift devices, and tracks for rear-mounted flaps are completely enclosed within the airfoil contour. The wing's leading edge is a continuously-changing curve, and the airfoil varies continuously from root to tip, which incorporates winglets. The aircraft controls are completely fly-by-wire, with no mechanical control between pilot and flight surfaces. The surfaces are moved by dual hydraulic systems. The G650 shares its yokes and column with the G550 in an effort to receive a common type rating. While most newer airliners now employ fly-by-wire technology, the G650 was only the second fly-by-wire business jet, after the Dassault Falcon 7X and before the Embraer Legacy 500. At FL 470 and ISA-7°C, it cruises at Mach 0.85 or 480 kn (890 km/h) TAS and burns 2,400 lb (1,100 kg) per hour at a weight of 67,500 lb (30,600 kg), raising to 3,000 lb (1,400 kg) per h at Mach 0.90 or 506 kn (937 km/h) TAS. Extended Range version, with maximum takeoff weight increased by 4,000 pounds (1,814 kg) and an equivalent increase in fuel capacity; capable of flying 7,500 nautical miles (8,600 mi; 13,900 km) at Mach 0.85. Certified in October 2014. Fuel capacity of the wet wings is increased by a modification to the fuel system, through a service bulletin; the modification is available as a $2 million retrofit for existing G650 aircraft. The list price for new a G650ER aircraft was $66.5 million in 2014. 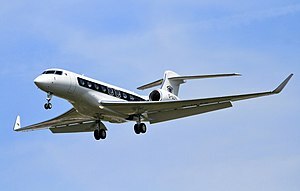 On April 2, 2011, the second G650 test aircraft crashed during takeoff from the Roswell International Air Center, New Mexico, killing the four Gulfstream employees on board (two pilots and two test engineers). The aircraft was conducting a takeoff-performance test during which an engine failure was simulated by reducing the right engine's thrust to idle. The G650 became airborne briefly at a high angle of attack before its right wingtip hit the runway, then slid on the ground, struck a concrete berm, and caught fire. The National Transportation Safety Board (NTSB) determined the probable cause of the crash was an aerodynamic stall of the aircraft, due to a failure to properly develop and validate takeoff speeds involving persistent and increasingly aggressive attempts to achieve a V2 speed that was too low. It found that Gulfstream's investigation of the two previous uncommanded roll events was inadequate. Following the crash, Gulfstream raised the V2 speed of the G650 from 135 knots (250 km/h) to 150 knots (280 km/h). The NTSB accused Gulfstream of withholding information, which the company denied. The NTSB also objected to Gulfstream's use of legal counsel during the investigation. ^ "Gulfstream G650ER Connects New York With Dubai In Record Time" (Press release). Gulfstream. December 10, 2018. ^ "Long Range Jets". Airstream Jets. Archived from the original on 17 November 2015. Retrieved 13 November 2015. ^ "Gulfstream delivers 300th G650" (Press release). Gulfstream. April 11, 2018. ^ "New Gulfstream", Flying, Vol. 135., No. 5, May 2008, p. 52. ^ Flying, May 2008, p. 56. ^ "Photo Exclusive: The Gulfstream G650". The Enterprise Report.com, September 27, 2009. ^ Larson, George. "Gulfstream G650 Rolls Out". Aviation Week, September 29, 2009. ^ "News Channel - Homepage - flightglobal.com". Flightglobal.com. Retrieved 22 November 2017. ^ "Gulfstream G650 Reaches Mach 0.995". Gulfstream.com, August 26, 2010. ^ "Investigators seek clues in G650 Crash". ^ Mayle, Mary Carr. "Gulfstream G650 gets FAA certification" Savannah Morning News, 8 September 2012. Retrieved: 8 September 2012. ^ Brown, Sarah. "'Ultra-ultra' G650 gets type certificate" Aircraft Owners and Pilots Association, 7 September 2012. Retrieved: 8 September 2012. ^ "'Redneck' speed freak buys super-fast jet". CNN. Retrieved 27 December 2012. ^ "First G650 Delivered". Retrieved 27 December 2012. ^ Whyte, Alasdair. "Speculating on business jets". Corporate Jet Investor, November 18, 2013. ^ Whyte, Alasdair. "Second G650 trades". Corporate Jet Investor, November 22, 2013. ^ "Certification of Bombardier Global 7500 Puts Pressure on G650ER Values". Aircraft Value News. Access Intelligence. November 26, 2018. ^ Donald, David (May 19, 2014). "G650ER To Go Extra Miles, Available New Or Retrofit". ainonline.com. The Convention News Co., Inc. Retrieved May 25, 2014. ^ Trautvetter, Chad. "Globe-girdling Gulfstream G650ER Gets Its Wings" AINonline, 9 October 2014. Accessed: 19 May 2015. ^ Garvey, William & Salerno. Jessica A. "Gulfstream 650ER Enters Service" Aviation Week, 1 January 2015. Accessed: 19 May 2015. ^ Sarsfield, Kate (March 6, 2019). "Global 7500 sets business jet range record". Flightglobal. Reed Business Information. Retrieved March 19, 2019. ^ "Gulfstream G650ER Shatters Speed Record For Farthest Business Jet Flight In History" (Press release). Gulfstream. 8 April 2019. ^ "Gulfstream to pitch G650 for JSTARS replacement". Flightglobal.com, May 22, 2014. ^ "Gulfstream G650 Conducts Steep Approach Trials at LCY". AIN Online, September 20, 2018. ^ "Rolls-Royce presents BR725 engine to power new Gulfstream G650" Archived 2008-11-15 at the Wayback Machine, Rolls-Royce, March 13, 2008. ^ Warwick, Graham. "Gulfstream G650 - in the cabin". Flightglobal.com, 13 March 2008. ^ a b "G650 Specifications" (PDF). Gulfstream. 2015. ^ "Gulfstream launches 'ultra-ultra' G650". www.aopa.org. 14 March 2008. Retrieved 22 November 2017. ^ "Gulfstream Expansion Spurs Production Evolution". ainonline.com. Retrieved 22 November 2017. ^ Warwick, Graham. "Gulfstream G650 - in the cockpit". Flightglobal.com, March 13, 2008. ^ "Fly by Wire: Fact versus Science Fiction". Flying. April 23, 2014. ^ Fred George (Mar 25, 2013). "Latest Business Jet Offering Raises The Bar". Aviation Week & Space Technology. ^ "Longer-ranging Gulfsteam G650ER visits Melbourne on record-breaking flight". australianaviation.com.au. Phantom Media Pty Ltd. May 20, 2014. Retrieved May 25, 2014. ^ Trautvetter, Chad. "Globe-girdling Gulfstream G650ER Gets Its Wings" AINonline, 9 October 2014. Accessed: 19 October 2014. ^ Fred George (May 19, 2014). "Gulfstream Announces G650ER". Aviation Week. ^ a b "Crash During Experimental Test Flight, Gulfstream Aerospace Corporation GVI (G650), N652GD, Roswell, New Mexico, April 2, 2011" page 34. Conclusion on page 52. U.S. National Transportation Safety Board, October 10, 2012. ^ Ostrower, Jon. "G650 was at high angle of attack prior to accident". Flight International, April 6, 2011. ^ Croft, John. "Two wing-drop incidents preceded G650 crash – NTSB". Flight International, May 11, 2012. ^ "G650ER Specifications" (PDF). Gulfstream. 2015. ^ Fred George (Apr 1, 2013). "Gulfstream G650 − Fastest, biggest, farthest ranging and most advanced Gulfstream yet". Business & Commercial Aviation. "Gulfstream Introduces the All-New Gulfstream G650" (Press release). Gulfstream. 2008-03-13. "Gulfstream launches 'biggest, furthest, fastest' G650 business jet". Flightglobal. 2008-03-13. "G650: As good as it gets?". Flight International. 2008-09-29. Fred George (Mar 25, 2013). "Latest Business Jet Offering Raises The Bar − Gulfstream's new way to travel fast, far and in quiet comfort is vetted". Aviation Week & Space Technology.